Special hand-casting of puzzle pieces just in time for Valentines Day. This gorgeous piece is trimmed with turquoise and orange beading and green beads, strung with aqua leather and clasped with silver clip. With a shiny side and a matt side, you can wear this piece either side and feel fabulous. 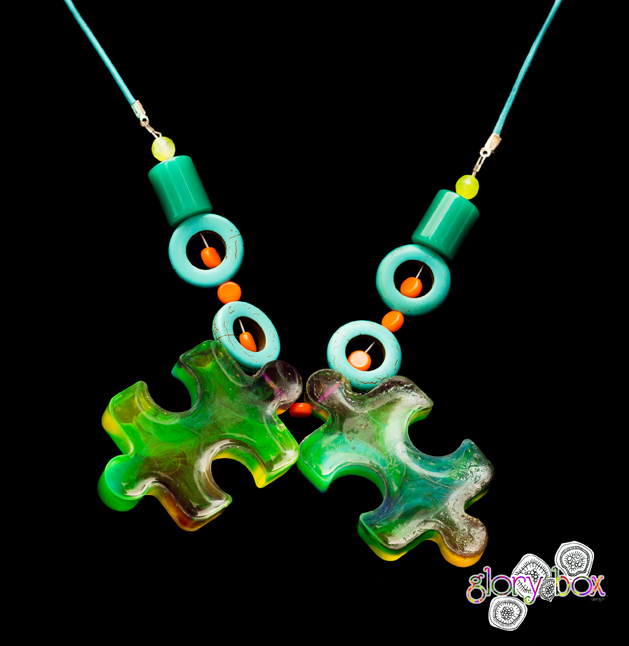 The beautiful colours blend in the puzzle pieces, allowing you to make all sorts of cliched statements as you gift your loved one this item. (We would love to hear some) With a finished length of 35cm, it sits nicely on the décolletage.